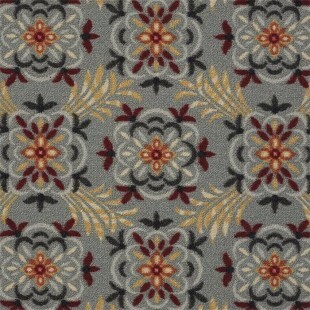 Beautiful nylon pattern print carpet. If you're looking for bold, yet beautiful, choose Hospitality 500...versatile in every way! Great for use in all public space areas or residential. 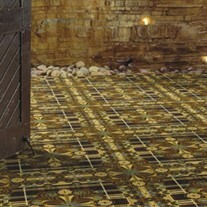 Hotel, office, church and stairs, this one brings charm and elegance to your floor. A full 28 ounce continuous filament nylon, manufactured to give you long term durability, and beauty. Backed up by a 25 year wear resist warranty, tells the story of our confidence in this carpet! 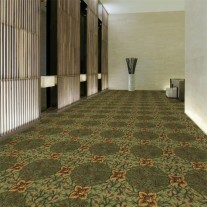 Hospitality 500 gives your floor an exceptional look. 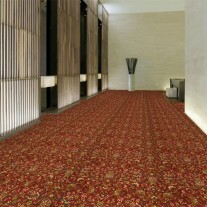 A durable, 100% nylon patterned carpet, with a touch of modern. Beauty, comfort and a great warranty. Also great for binding to make a perfect room sized rug. We offer custom sizes, cut and bound to your room needs! If you love the look of Hospitality 500, but want to browse some very similar take a look at 2011 Noble, 2293 Sophie, and 2280 Botanic. Promotional price posted is for full rolls or more, Any size can be purchased, and if less than roll call for pricing. A Sample Swatch is a 6"x6" or stock size of only one color. Make your choice by selecting a color above, then click "Add Sample to Cart." Price is $5.00 each.